The labyrinth plaza is finished, and ready for you to walk it. Outdoor lights on the canopy pillars, over classroom windows, and new dim lighting on the stairs and north wall of the plaza make the way safe for evening walking, too. Please pass the word. Go to the Labyrinth Plaza Update page for more photos, news and a history of progress. After their wedding vows, Craig & Danielle Mehall celebrate on the new labyrinth. 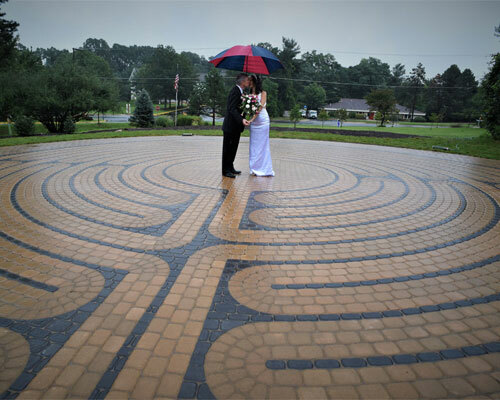 Our labyrinth is the face of a larger plaza that provides space for a variety of other activities—weddings, services, seasonal celebrations and special events—our Unity of Fairfax Labyrinth Plaza! 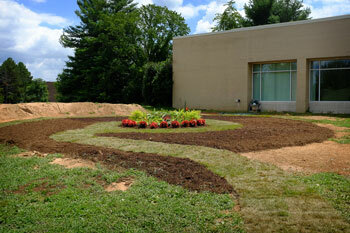 Why a Permanent, Outdoor Labyrinth at Unity of Fairfax? Across time and across cultures, human beings have found great spiritual value in walking a labyrinth. It is a spiritual practice that seems to be embedded in the consciousness of humanity. There is a holy calling to take a symbolic walk to one’s center and receive the gifts given there. For many years, on New Year’s Day for example, a canvas labyrinth has been laid out in our Sanctuary. Members and friends of Unity of Fairfax have found great inspiration, solace, and clarity when walking the canvas labyrinth. The new permanent, outdoor labyrinth is now open 24 hours a day. 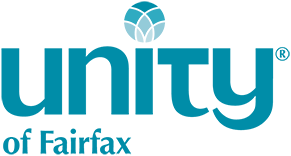 We will welcome everyone, from Northern Virginia neighbors and the world, regardless of faith tradition, to engage in this deep archetypal practice and to experience the sacred power of walking a labyrinth. The new labyrinth also serves as a beautiful and inspirational reminder that although each person’s journey through life is private, ultimately we walk together in a spirit of oneness. At the beginning of summer 2018, the 52-foot labyrinth plaza area was leveled with a slight slope away from the building. An interim circular garden was created in the plaza area by Earthcare volunteers on July 26th. The garden was designed by Rick Hartley, one of our Earthcare founders. You may have noticed the “Visualize Our Labyrinth Here” sign at the main entrance to the building. View a Photo Album of volunteers doing the shoveling and laying the mulch for pre-labyrinth beautification. Thank you for the prayers and visualization energy that contributed to the completion of the labyrinth!